La Quinta Luna in San Pedro Cholula (in the state of Puebla, and part of the Metropolitan area of Puebla) had me at “who would have guessed San Pedro Cholula had such a beautiful and hard-to-find, gorgeous boutique hotel?” (and yes, my dear fellow #WeVisitMexico travel writers – I did not use “hidden gem” – be proud of me!) Had I been given the option of changing hotels and staying at La Quinta Luna for a night, I would TOTALLY have done it. And even though the prices are again, a bit higher for the Mexican standards that I know ($150-$220 USD), Hotel La Quinta Luna is absolutely worth the money you pay for it. Before I discuss our breakfast, let me show you just exactly why did I want to stay here at least one night, had I been given the chance. 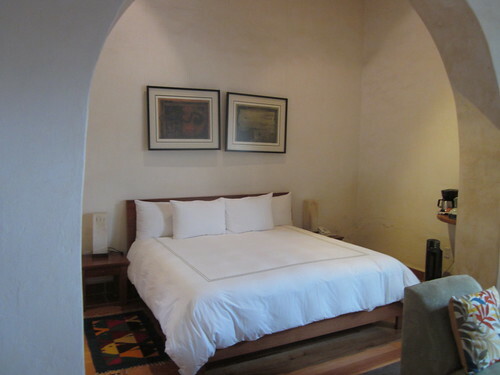 La Quinta Luna is situated in the oldest living city of the American Continent, Cholula, in the outskirts of Puebla, approximately 70 miles east from Mexico City. 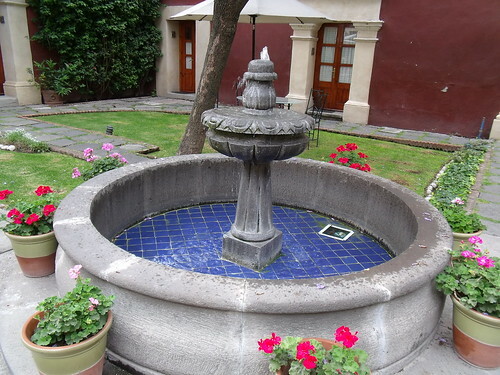 The hotel is located in the quarter of Santa María Xixitla, which is part of the city of Cholula since the prehispanic period. 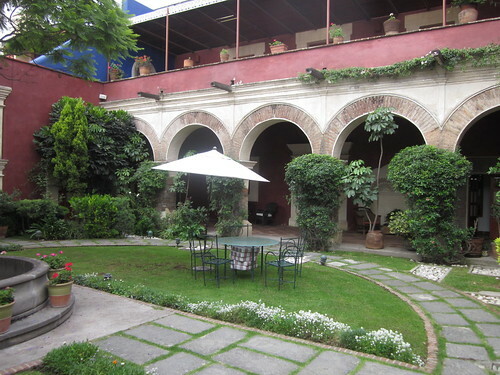 La Quinta Luna was found in a seventeenth century mansion, which was completely restored in 1996-1998 by the Cárdenas González de Cossío family, who still lives in it and manages the hotel. The house is a catalogued historic building which fully preserves its original structure. 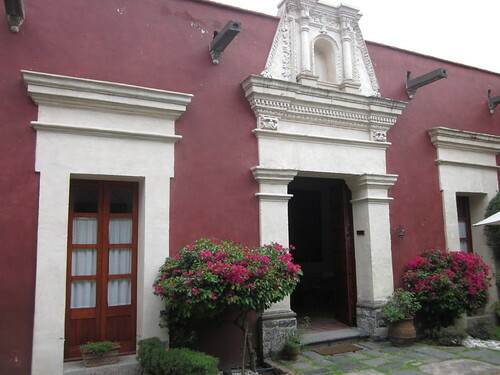 During colonial times, the house probably hosted Don Juan de León y Mendoza, a descendent of the Prehispanic indigenous nobility and one of the most important chiefs of the earlier eighteenth century. Today, there is an exquisite contrast between classical colonial arquitecture which is represented by the building, and contemporary Mexican art which dresses its walls with colour and form. Different cooks will make chilaquiles differently. In the case of Hotel La Quinta Luna (which translates as “The Fifth Moon”), a red or green sauce is prepared separately and corn tortilla chips are drenched in it just before serving the dish. In the case of my Mom’s chilaquiles, she cooks the tortilla chips in the sauce. 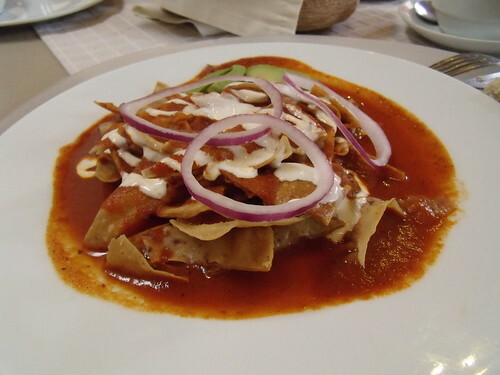 At our hotel (El Sueño Hotel and Spa) chilaquiles were cooked and served with chicken or shredded beef, much like my Mom’s. Our chilaquiles were preceded by a fruit platter and some juice, much like the continental/Mexican breakfasts I’ve had before. I really liked the opportunity to visit a different hotel and have breakfast there (I’ll fully confess I didn’t find much difference in quality of breakfast, all were fantastic. 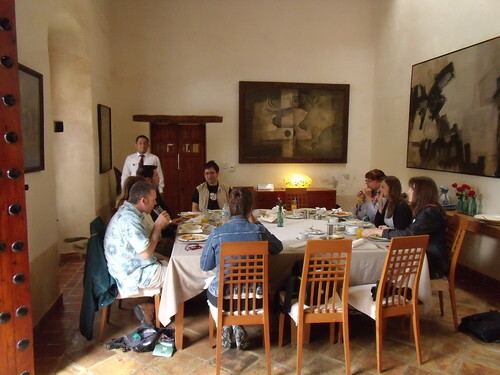 I think the extra allure was in visiting a different hotel/location and trying various styles of cuisine). I am disappointed that I didn’t realize most of my Quinta Luna photos were out of focus (something I fixed later in the trip), otherwise I’d show you the rest of our wonderful tour throughout this gorgeous boutique hotel. I am also disappointed that I did not have the time nor the opportunity to check out the Library, because there was an event happening there at the time. 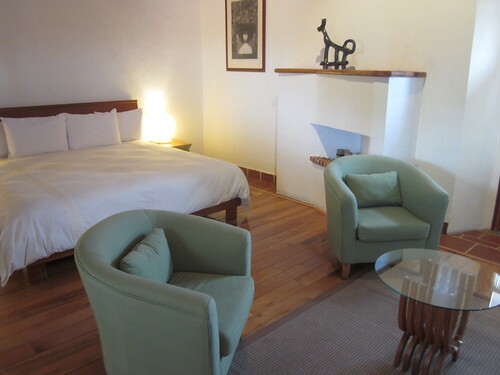 But if I ever organize a retreat, I’ll definitely consider La Quinta Luna. You should check out their cultural tourism packages, they’re pretty great. And here is a group photo of my lovely WeVisitMexico fellow travel writers. For Vancouverites who want to try chilaquiles, The Red Wagon on Hastings does an amazing version with poached eggs and optional pulled pork. I’ve had them twice and can highly recommend!